wires are 1.5mm steel rope. For ceilings fixed at both ends, these will include a tensioner to keep the wire taut. 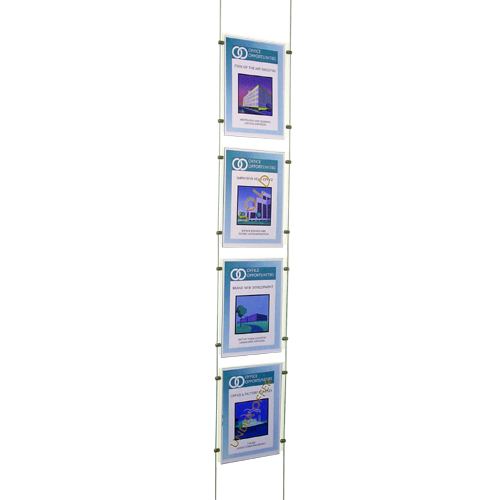 acrylic multi-poster holders - double or triple holders display the posters side-by-side, with separation between them. They are also naturally double-sided. fixings for wires may be ECONOMY (satin anodised aluminium) or NICKEL (plated brass) - satin chrome and gold platings are also available on request. Fixings for 4mm bars and 10mm bars are satin anodised aluminium.